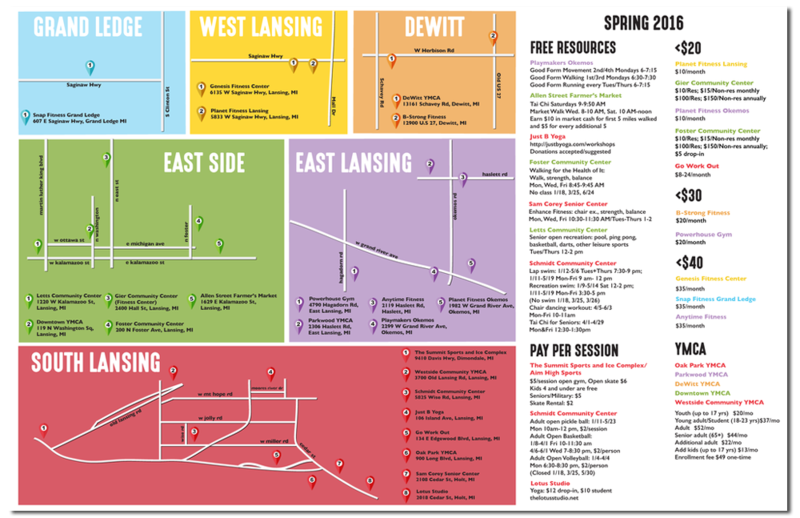 A print and digital informational map that displays exercise options around the greater Lansing area. LLHA is a non-profit organization that provides health and wellness resources to members of the Latino community in the Greater Lansing, MI area. There was a lot of information about affordable local gyms and fitness classes that they wanted to organize into an easy, understandable resource that people in the community could refer to and utilize. To make the information more cohesive and accessible, I created a 11x17 map that simplified the resource listings and allowed users to visually sort the places and activities by either location or price. The map was printed inside of an illustrated pamphlet and diseminated throughout the Lansing area. My redesign - using color to divide resources by cost and location.